Messier 3 (M3 or NGC 5272) is a globular cluster of stars in the northern constellation of Canes Venatici. It was discovered on May 3, 1764 and was the first Messier object to be discovered by Charles Messier himself. Messier originally mistook the object for a nebula without stars. This mistake was corrected after the stars were resolved by William Herschel around 1784. Since then, it has become one of the best-studied globular clusters. Identification of the cluster's unusually large variable star​ population was begun in 1913 by American astronomer Solon Irving Bailey and new variable members continue to be identified up through 2004. 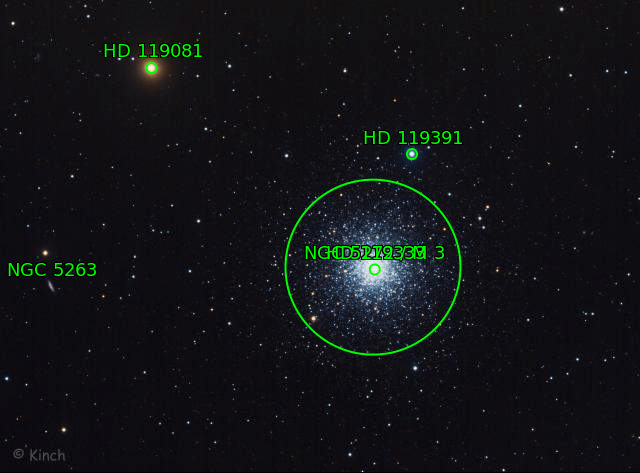 Many amateur astronomers consider it one of the finest northern globular clusters, following only Messier 13.M3 has an apparent magnitude of 6.2, making it a difficult naked eye target even with dark conditions. 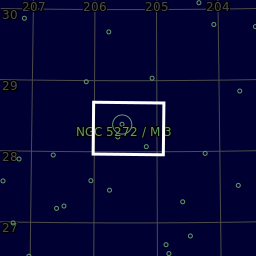 With a moderate-sized telescope, the cluster is fully defined. 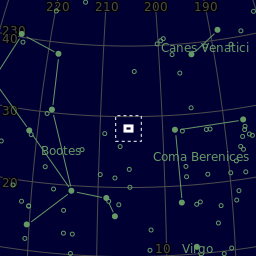 It can be a challenge to locate through the technique of star hopping, but can be found by looking almost exactly halfway along an imaginary line connecting the bright star Arcturus to Cor Caroli. Using a telescope with a 25 cm (9.8 in) aperture, the cluster has a bright core with a diameter of about 6 arcminutes and spans a total of 12 arcminutes. Center (Dec, dms):+28° 19' 39.648"